At 8pm, on what had been an incredibly busy Thursday, I remembered I had promised to take in cookies for the teacher's birthday celebration in the morning. I made a quick stop at the local specialty food store to pick up a bag of our favorite dairy-free, eg-free and nut-free chocolate chips. Chocolate Dream Dairy-Free Chocolate Chip Review from S.A.F.E. Always thrilled to find yet a new product to try out, I found another chocolate chip distributor who is offering a product catering to those of us in the food allergy community. Even better, was that they were on sale. 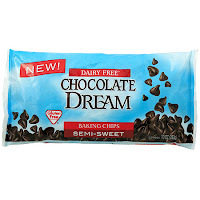 Chocolate Dream Semi-Sweet Baking Chips, distributed by The Hain Celestial Group, Inc., Melville, NY. Ingredients listed include: EVAPORATED CANE JUICE, UNSWEETENED CHOCOLATE, COCOA BUTTER, SOY LECITHIN, GROUND VANILLA BEANS. For more information, visit: Taste the Dream or call, 1-800-434-4246. I was not disappointed with the results of my late night baking adventure. I had my taste testers try them out for breakfast and they loved them! Dad, who is NOT milk allergic, even enjoyed them! Then again, I'm lucky there. He's seems to enjoy just about any baked goods I offer him. I am looking forward to trying out their Dream Chocolate bars too!